most reactive. Photosystem I tends to react more around 700 nm and photosystem II is more reactive around 680nm. The difference between the two systems can also be determined by the type of terminal electron acceptor located on the molecule. Photosystems that are type 1 use ferredoxin-like sulfur clusters as electron acceptors and type 2 systems use a quinine terminal electron acceptor. The light energy is eventually used by photosystems I and II to generate proton motive force and reducing power (NADPH or NADH). The proton motive force is used by ATP synthase to generate ATP, essentially in the same way as the mitochondrial respiratory chain. The supplies of ATP and NAD(P)H are then used to fix carbon dioxide. Light harvesting refers to the process of absorption of light and the subsequent transfer of energy to the photosynthetic reaction center (RC). 200–300 chlorophyll (chl) molecules are structurally and functionally associated with an RC to form a functional PSII (photosystem II) unit. The absence of a significant energy gradient between LHCII, the core antenna, and the reaction center core, together with the reversibility of charge separation, results in equilibration of energy between them. As a consequence of the large number of chlorophyll molecules in LHCII, there is a high probability that an excited state will be found in this complex. Hence, a quencher (Q) within LHCII provides effective energy dissipation. The arrows represent the randomness of energy transfer events and indicate the relative numbers of chl molecules in each set of complexes (200 in LHCII, 50 in core antenna, 4 in reaction center). The wavelengths correspond with approximate ranges of excited state energy levels of the chls. ﻿Photosynthetic organisms have evolved elaborate methods to efficiently capture light, which is often times limiting in their natural habitats. 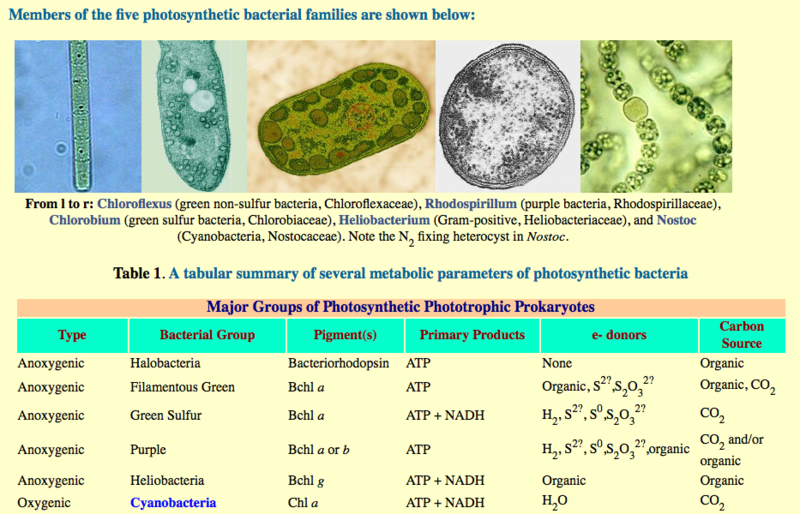 Eukaryotic photoautotrophic organisms encode a superfamily of chlorophyll and carotenoid-binding proteins known as the light-harvesting complexes (LHCs), which capture and transfer light energy to the photosynthetic reaction centers [Green B R and Dumford D G. “The chlorophyll-carotenoid proteins of oxygenic photosynthesis.” Ann Rev Plant Physiol Plant Mol Biol (1996). 47:685-714]. Chlorophyll molecules are specifically arranged in so called “antenna” structures; the number of chlorophyll molecules per reaction center can vary considerably encompassing upwards of 350 chlorophyll a and chlorophyll b molecules per reaction center for photosystem II (PSII) and 300 chlorophyll a molecules for photosystem I (PSI). Antennas provide a means to increase light absorption spectra without having to build an entirely new protein-based reaction center and accompanying electron transport system. Large antenna provides survival advantages to organisms in the wild; however, under conditions of high light intensity, they absorb excess photons which must be wastefully dissipated as fluorescence or heat. Failure to safely dissipate a singlet-state excited chlorophyll molecule can result in formation of singlet oxygen, which is an extremely damaging reactive oxygen species [Muller P, Li X, Niyogi K K. “Non-photochemical quenching. 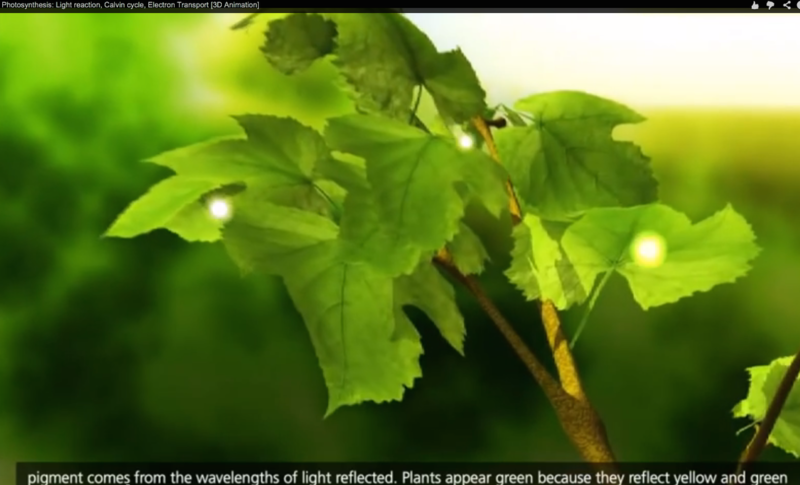 A response to excess light energy.” Plant Physiology (2001). 125:1558-66]. Organisms naturally increase or decrease their chlorophyll antenna size as an adaptive response to changing light conditions [Falkowski P G and Owens T G. “Light-shade adaptation.” Plant Physiol (1980). 66:592-595; Ballottari M, Dall'Osto L, Morosinotto T, and Bassi R. “Contrasting behavior of higher plant photosystem I and II antenna systems during acclimation.” J Biol Chem (2007). 282(12):8947-58]. Phycobilins: Phycocyanin, phycoerythrin, allophycocyanin, bound to proteins (phycobiliproteins). Phycobilins close the „gap“ in the absorption spectra of chlorophyll and carotenoids and act as antenna pigments. Blue-green cyanobacteria contain phycocyanin, redish cyanobacteria contain phycoerythrin. Phycoerythrin exhibits yellow autofluorescence (e.g. Synechococcus species often exhibit yellow autofluorescence due to phycoerythrins, other species containing mostly Chlorophyll a exhibit red autofluorescence). Phycobiliproteins are located in disk-shaped or hemispherical phycobilisomes on the surface of thylakoids. Photosynthesis requires light in the vicinity of the absorption peaks of chlorophyll a and b in cells (435 or 670-680 nm and 480 or 650 nm, respectively). See Table below for absorption maxima of different pigments found in nature. 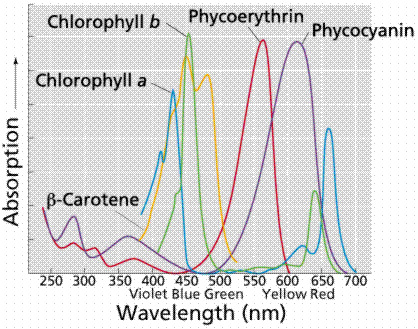 Chlorophyll a has an absorption peak at approximately 435 nm, but it drops to near zero at 655 nm before absorbing again at 670-680 nm), leaving only a small part of the narrow blue LED spectrum overlapping the chlorophyll spectrum. Pigments have an alternating arrangement of single and double bonds in the molecule's carbons; these are conjugated bonds that share electrons. Pigments conjugated bonds share electrons in pi orbitals across the whole structure. Conjugated bond length and arrangement within a pigment molecule determines the wavelength (nm) to be absorbed. Chlorophyll's conjugated bonds are found in the porphyrin ring, made up of a cyclic tetrapyrrole (which chelates Magnesium) and in the side chain, which forms a long hydrocarbon tail to the heme ring. Electrons move readily along a conjugated bond series like they do in copper wire. When a photon of just the right amount of energy strikes an electron resonating in the pigment, the electron can absorb the photon and get promoted to a higher quantum level. The photon must have just the exact amount of energy to boost the electron from its current level to its new level or it cannot be absorbed. 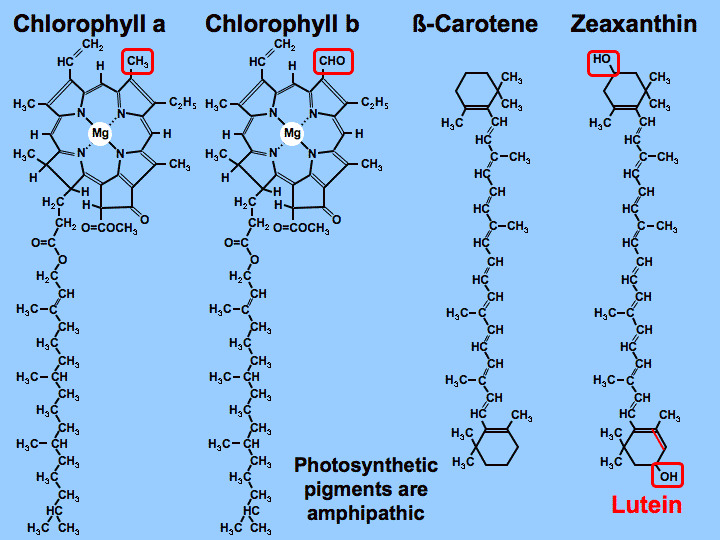 Each chlorophyll pigment A or B molecule differs in the bonds so each absorbs at a different wavelength. The only difference between Chlorophyll A and Chl B is one methyl group is changed to a formyl group but this changes the wavelength that can be absorbed by the molecule. 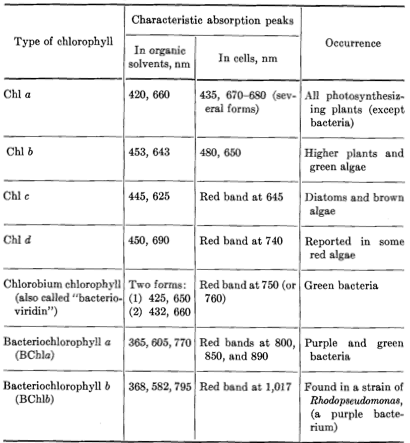 If the question is about why the chlorophylls have a 'green gap' in the absorption spectra then the answer is the 'Purple World' hypothesis: Early Earth's life reflected purple and used the abundant midspectra wavelengths absorbed by rhodopsin leaving the flanking spectral wavelengths as open but marginal niches bacteria using chlorophyll adapted to fill. ﻿Acaryochloris marina is the only known organism to have chlorophyll (Chl) d as its main Chl constituent. Chl d absorbs far-red/near IR (infrared) light in the range of 700 nm - 750 nm and carries out oxygenic photosynthesis. It also contains Chl a, found in many organisms as the primary constituent. Chl a differs from Chl d only in that it has a vinyl group in place of a formyl group. It is reasoned, then, that Chl d is derived from Chl a (or that a precursor of Chl d is derived from the analogous precursor of Chl a). Different sources of light and their wavelength spectra. Wavelength spectra of light emitted from an incandescent light bulb. ﻿A compact fluorescent lamp (CFL), also called compact fluorescent light, energy-saving light, and compact fluorescent tube, is a fluorescent lamp designed to replace an incandescent lamp; some types fit into light fixtures formerly used for incandescent lamps. 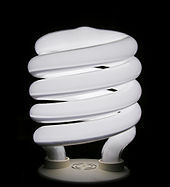 The lamps use a tube which is curved or folded to fit into the space of an incandescent bulb, and a compact electronic ballast in the base of the lamp. 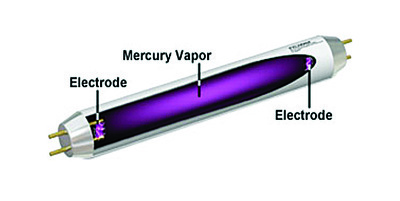 The spectrum of light emitted from a fluorescent lamp is the combination of light directly emitted by the mercury vapor, and light emitted by the phosphorescent coating. The spectral lines from the mercury emission and the phosphorescence effect give a combined spectral distribution of light that is different from those produced by incandescent sources. The relative intensity of light emitted in each narrow band of wavelengths over the visible spectrum is in different proportions compared to that of an incandescent source. ﻿Figure: Cell concentration, and cell weight of the microalgae Chlorella kessleri grown under constant-current light sources and constant light intensity.﻿ (Cell size was determined separately by microscopy of each sample). 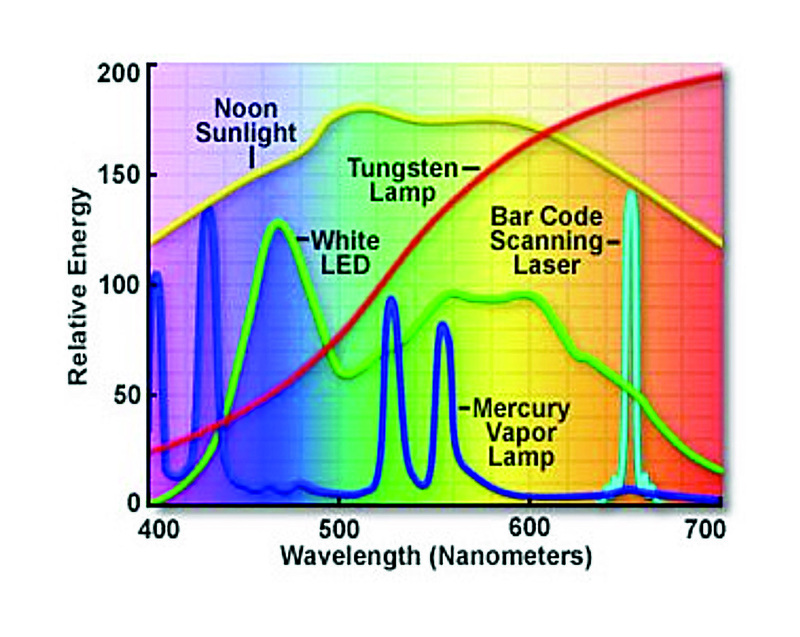 The red LED peak wavelength was chosen at 659 nm, in order to be distributed equally between the chlorophyll a and b absorption peaks (670 and 650 respectively). The blue LED peak wavelength was chosen at 467 nm, slightly shorter than the peak chlorophyll b absorption wavelength (chlorophyll a and b blue absorption peaks = 435 and 480 nm respectively). Previous studies showed that blue light can lead to larger cells (Lee and Palsson, 1994, 1996; Oldenhof et al., 2006) as a result of delayed cell division (Munzner and Voigt, 1992). 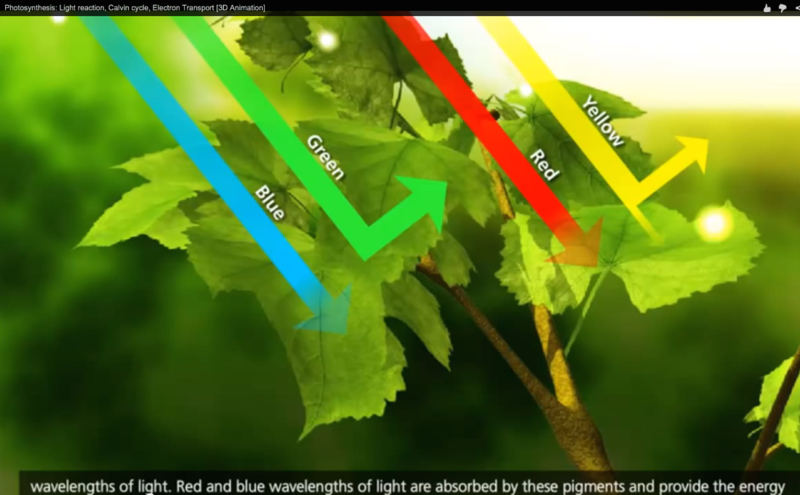 Phototropic processes, which control the motion of plant organs in response to light and ensure optimization of biophysical and biochemical reactions, are triggered by light with wavelengths in the range of 400-500 nm. The delay can be as much as two hours longer than with red light (Oldenhof et al., 2006). Red light caused mother cells to divide at the smallest size (approximately twice the size or one round of replication) regardless of how many autospores were present (Lee and Palsson, 1996; Oldenhof et al., 2006). The average cell volume of Chlorella decreased when mother cells divided into daughter cells under higher light intensity but the total cell volume remained the same (Lee and Palsson, 1994). 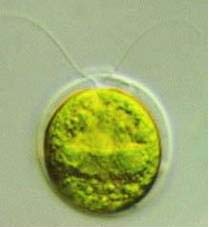 A large cell size does not necessarily mean more algae biomass. The constant current red LED produced more biomass (0.44 g/l) than the blue LED, even though the average cell was smaller. In summary, in the first experiment, in which the current of all three light sources was the same, red LED produced the highest number of cells with the highest weight while blue LED light produced the largest cells (measured by microscopy - not in graphs above). In the second experiment, in which the light intensity was the same for all three light sources, the highest weight was again achieved with the red LED although the fluorescent light source yielded more cells, however, The red LED was the most efficient light source in terms of cell concentration and weight (22.5 x 10e6 cells/ml and 0.45 g/l). Thus, it is suggested that the most advantageous production system may be to use a red light initially to produce the desired cell concentration, then switch to a blue light to increase cell size. pH and CO2 (air) inside a photobioreactor of the microalgae Chlorella kessleri grown under constant-current light sources and constant light intensity. The increase in pH indicates that carbon dioxide was consumed by the algae faster than it was supplied, or that the algae were producing a metabolite that tended to be basic. The highest pH was measured in the photobioreactors illuminated with the red LED and fluorescent lights, indicating that the algae in these photobioreactors were consuming more carbon dioxide and growing faster in number of cells, quantity of biomass, and size. The CO2 concentration in the exhaust air of the first experiment (constant current) was reasonably steady even though the pH increased, which could mean that more CO2 remained in the growth medium as bicarbonate or carbonate and was not off-gassed. Alternatively, it is possible that the time it took for the bubbles to pass through the photobioreactor was insufficient for the CO2 to transfer from the bubble to the growth medium, causing the increase in pH. In the constant intensity experiment, exhaust air CO2 concentration increased towards the end of the trial when the pH increased, supporting the hypothesis that the bubbles were not fully exchanging CO2 with the growth medium. Illumination: Panels (270 x 270 mm) with 59 blue and 384 red LED lights were obtained from Daktronics (Brookings, SD). Two experiments were conducted. In the first, each LED color was supplied by a constant current of 2.6 mA and constant voltage of 6.5 V for the blue LED and 11.0 V for the red. Thus, the actual power inputs were 16.9 W for the blue LED and 28.6 W for the red. The third illumination source was a fluorescent light powered by a 110 V line source. A three-channel fiber optic spectrometer (Avantes Inc., Broomfield, CO, USA) was used to measure the wavelengths and intensities of the light sources. The peak wavelengths were 467 nm for the blue LED and 659 nm for the red. 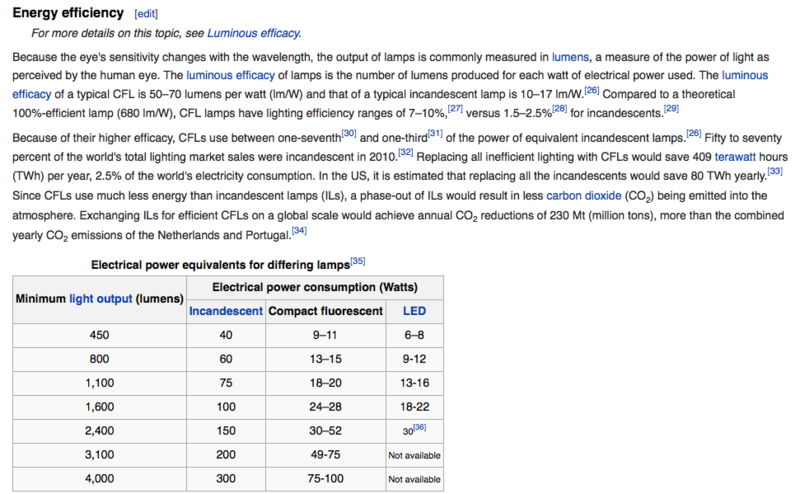 The panel light intensity, measured 1 cm from the light source, was 557 μW/cm2/nm for the blue LED, 272 μW/cm2/nm for the red LED, and 163 μW/cm2/nm for the fluorescent light. The intensity was 3019 lux for the blue LED, 1389 lux for the red LED, and 2936 lux for the fluorescent lights. In the second experiment, all three illumination sources had an intensity of approximately 6030 lux, obtained by adjusting the distance between the photobioreactor and the light source. In the second experiment, power inputs were 18 W for the blue LED and 6.042 W for the red LED. Power for the fluorescent light was maintained at the same level as in the first experiment. Cell analysis: Cells were analyzed by microscope and hemocytometer. Samples (10 ml) were taken from the photobioreactor and coated with 1 ml isotonic diluents (Fisher Scientific) to make the microalgae cells visible. Later, three 1-ml samples were mixed and counted. The number of cells was counted under a microscope (Electron Microscopy Sciences). Pictures were taken with a digital camera mounted on the microscope and transferred to a computer with Infinity 2 software. Measurements were repeated every 24 h. Three samples were taken each time and the average cell concentration was recorded. The number of cells in an area of 0.01 mm2 on the hemocytometer was multiplied by 10e4 to calculate the total number of cells per 1 ml. experiment, doubling time was calculated as N(t) = C2t/d, where N(t) = the number of objects at time t, d = doubling period (time it takes for object to double in number), c = initial number of objects, and t = time (Richmond, 2004). Koc, C., Anderson, G. A., & Kommareddy, A. (2013). Use of Red and Blue Light-Emitting Diodes (LED) and Fluorescent Lamps to Grow Microalgae in a Photobioreactor Caner. The Israeli Journal of Aquaculture, IJA_65.201(65), 8. Phycobilisomes, the light harvesting antenna of cyanobacteria and red algae, are primarily comprised of the phycobiliproteins phycoerythrin (PE), phycocyanin (PC), and allophycocyanin (AP) [Grossman A R, Schaefer M R, Chiang G G, and Collier J L. “The phycobilisome, a light-harvesting complex responsive to environmental conditions.” Microbiol Rev (1993). 57(3):725-49]. 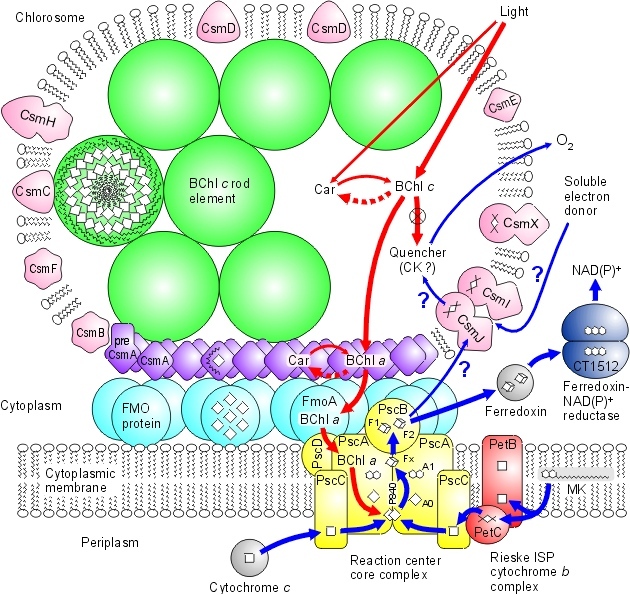 While photoautotrophic organisms invariably utilize photosynthetic reaction centers to convert photonic energy into chemical energy (in the form of ATP, via proton motive force (PMF)-driven ATP synthase) and reducing power (NADPH), no known photoautotrophic organisms employ light-activated proton translocation systems as exemplified by archaeal rhodopsin-like proteins (bacteriorhodopsin) (1). Nevertheless, related sequences have definitively been shown to mediate light-driven energy generation (photoheterotrophy) in bacteria (2-4). Bacteriorhodopsin is a protein used by Archaea, the most notable one being Halobacteria. It acts as a proton pump; that is, it captures light energy and uses it to move protons across the membrane out of the cell. The resulting proton gradient is subsequently converted into chemical energy. The bacteriorhodopsin molecule is purple and is most efficient at absorbing green light (wavelength 500-650 nm, with the absorption maximum at 568 nm). Bacteriorhodopsin belongs to a family of bacterial proteins related to vertebrate rhodopsins, the pigments that sense light in the retina. Rhodopsins also contain retinal; however, the functions of rhodopsin and bacteriorhodopsin are different, and there is limited similarity in their amino acid sequences. 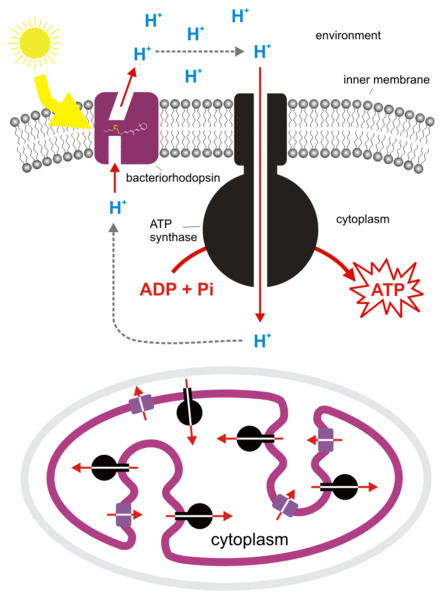 Left figure: Chemiosmotic coupling between the sun energy, bacteriorhodopsin and phosphorylation by ATP synthase (chemical energy) during photosynthesis in halophilic archaea Halobacterium salinarum (syn. H. halobium). Oesterhelt D and Stoeckenius W. “Rhodopsin-like protein from the purple membrane of Halobacterium halobium.” Nature New Biol (1971). 233(39):149-52]. de la Torre J R, Christianson L M, Beja O, Suzuki M T, Karl D M, Heidelberg J, and DeLong E F. “Proteorhodopsin genes are distributed among divergent marine bacterial taxa.” Proc Natl Acad. Sci. (2003). 100(22):12830-5]. $60 Instant Savings and Free Shipping on 55" JVC LED 1080p 120Hz TV Get over $3,500 in Instant Savings at Sam’s Club now through June 8th!